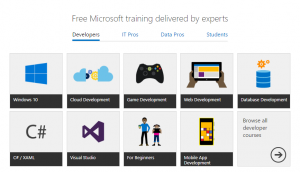 Home Uncategorized මොකක්ද මේ Microsoft Virtual Academy කියන්නේ? මොකක්ද මේ Microsoft Virtual Academy කියන්නේ? අපි කෙටියෙන් MVA කියලත් හඳුන්වනවා. ඇත්තටම මොකක්ද මේක? ඇත්තටම මේක online learning center එකක්, තවත් සරලව කිව්වොත් programming language ඉගෙනගන්න ආස අයට ගෙදර ඉදලම ඉගෙන ගන්න හදල තියෙන platform එකක්. මේකේ අන්තර්ගත වෙන්නේ Microsoft සමාගම භාවිතා කරන, Microsoft සමාගම විසින් සපයන සේවා විතරයි. 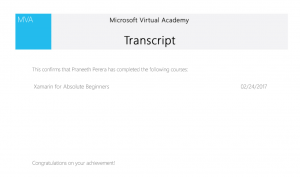 Microsoft Virtual Academy එකේ courses ගොඩක් තියෙනවා. අපි courses select කරාම ඉගෙන ගන්නා ඕනෑම කෙනෙකුට පහසු වෙන්න එය By topics, By-products සහ popular courses යනුවෙන් කාණ්ඩ 3ක් යටතේ බෙදා තියෙනවා. තවද user friendliness එක වැඩි වෙන්න home page එකේදිම main topics වලට බෙදල තියෙනවා, මෙහි අරමුණ තමයි programming ඉගෙනගන්නා beginner කෙනෙකුට තමන්ට අවශ්‍ය පරමාර්ථය අනුව ඒ විෂයට අදාළ content එක හොයාගන්න ලේසි වෙන එක. 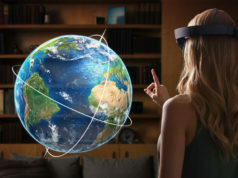 මේ බොහොම මෑතකදී Microsoft Virtual Academy තවත් අලුත් දෙයක් හඳුන්වා දුන්නා. ඒ තමා Learning Paths කියන category එක. Learning Paths තුලින් programming කරන්නෙකුට හෝ developer කෙනෙකුට තමන්ට අවශ්‍ය වෘත්තීය මග පෙන්වීම මේ තුලින් යම් විදියකට ලබාගන්න පුළුවන්. 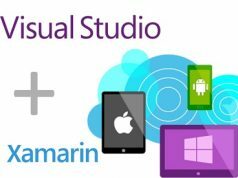 Microsoft Virtual Academy ඇති විශේෂත්වය තමයි මෙහි courses එකින් එක අවසන් කරන විට points, badge සහ Transcript ලබාගන්න පුළුවන් වීම. මෙය එක්තරා විදියට motivation factor එකක් එහෙමත් නැත්නම් යම් කිසි උත්තේජනයක් විදියට බලපනනවා. මේ තියෙන්නේ එවැනි Transcript එකක්. කොහොමද අපි Microsoft Virtual Academy එකට join වෙන්නේ? මේ සදහා ඔයාලට ඕන කරනවා Microsoft Outlook account එකක්. Microsoft Virtual Academy website එකට ගියාම ඔයාලට පේනවා දකුණු පැත්තේ උඩින්ම “Sign in” කියලා button එකක් ඒකෙන් ඔයාලට Microsoft Virtual Academy එකේ account එකක් හදාගන්න පුළුවන්. ඔයා account එකක් හදා ගත්තට පස්සේ ඔයාගේ dashboard එක ඔයාට පෙන්නනවා. ඔයාගේ courses ගැන සියලුම තොරතුරු, කරන්න පටන් ගත්ත courses, දැනට කරන courses සහ ඉවර කරපු courses මෙතැනින් බලාගන්න පුළුවන්. ඒ වගේම වැදගත් newsfeed පවා මෙතන වැටෙනවා. 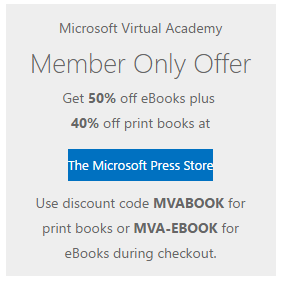 තවත් වාසියක් තමා Microsoft Virtual Academy account තියෙන අයට 50% යටතේ ebooks ද, 40% යටතේ print books Microsoft press store එකෙන් ලබා ගන්න පුළුවන්. Microsoft Virtual Academy පාවිච්චි කරලා ඔයත් ඔයාගේ programming skill එක වැඩිදියුණු කරගන්න. Microsoft Virtual Academy එක ඔයාට ඒකට ලොකු උදව්වක් වෙයි.